A professional-quality interior coating designed to meet the needs of professional painting contractors, facility managers, and property managers. 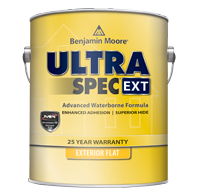 Ultra Spec EXT is a low-VOC waterborne acrylic made for contractors and professionals. It's also great for budget minded homeowners as well.